Decorated in warm colours, the air-conditioned accommodation will provide you with a flat-screen satellite TV and desk. Featuring a shower, private bathrooms also come with free toiletries. Some of the rooms have a balcony. Located at a distance of 2 km from one of the oldest art galleries of India, National Art Gallery, Sree Devi Niwas is a self-catering accommodation that operates a 24-hour front desk to assist guests. Free Wi-Fi access is available. The 8th Century Temple, Parthasarthi and the beautiful and serene Marina Beach are 4 km from the property. The town of Mahabalipuram is 50 km away. The Koyamedu Bus Station is 6 km, the Central Railway Station is 7 km and the Chennai International Airport is 13 km. At Sree Devi Niwas you will find services like dry cleaning and laundry. Other facilities like tour desk and luggage storage are offered. A car can be rented for exploring the nearby areas. The property offers free parking. The property houses a shared kitchen where guests can cook for themselves. Decorated in warm colours, the air-conditioned accommodation will provide you with a flat-screen satellite TV and desk. Featuring a shower, private bathrooms also come with free toiletries. Decorated in warm colours, the spacious air-conditioned accommodation will provide you with a flat-screen satellite TV, balcony and desk. Featuring a shower, private bathrooms also come with free toiletries. This double room features air conditioning, sofa and satellite TV. An average hotel with little amenities. Not top notch hotel. Bit difficult to go there with narrow roads. Rooms are tiny. Only advantage its near to panagal park all the big shopping places are near by. Staffs are very polite and helpful. Best hotel you could find in Chennai. bang for the buck! I have stayed there quite a few times. It located at T. Nagar at the heart of Chennai. The staffs are extremely friendly and polite. A very good place indeed. Excellent location. Courteous staff. 2 cars cars can be parked. Open parking available opp apartment. Excellent choice. 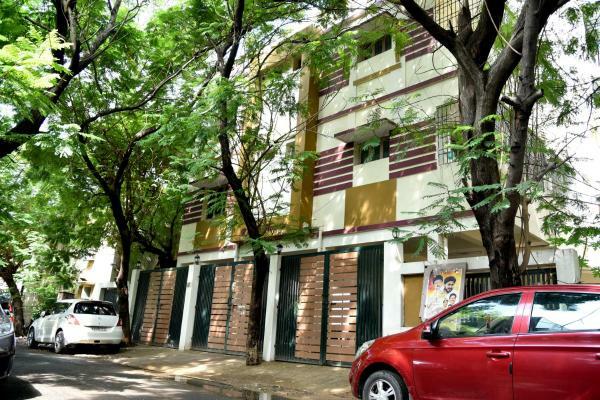 A nice place in the heart of t. Nagar with close proximity to all shopping complexes. Would come back here again for stay to Chennai. May be my expectations are high. Staff are courteous, clearness / hygiene factors can be high — Clean towels, non leaky basins. I stayed at the facility diagonally opposite to Mupattamman temple on Maharajapuram Santhanam Salai road. Good place, clean and fresh facilities, management is very responsive and staff are courteous and quick to respond, highly recommend it. Please note that the check-in and key-collection take place at: No16,Maharajapuram sandhanam salai, , T.Nagar,, 600017 Chennai. Please inform Sree Devi Niwas T Nagar in advance of your expected arrival time. You can use the Special Requests box when booking, or contact the property directly with the contact details provided in your confirmation. Up to two children under 10 years stay free of charge when using existing beds. One older child or adult is charged 500 per person per night in an extra bed.